A compositionally balanced bright yellow power, our Solvent Yellow 18 is a versatile dye. It is produced by us with premium chemicals. Buyers can rely on our Solvent Yellow 18 as it imparts excellent color and guarantees to be colorfast. 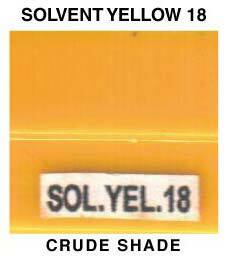 Interested buyers can purchase Solvent Yellow 18 from us as we are one of it’s leading Manufacturers, Exporters and Suppliers in Maharashtra, India.